POSH LATEST: Reduced admission prices for FA Cup tie. Posh players celebrate a goal in their second round FA Cup victory over Luton. Photo: Joe Dent/theposh.com. Peterborough United have again reduced admission prices for an FA Cup tie with even bigger discounts available if tickets are purchased before the end of the year. 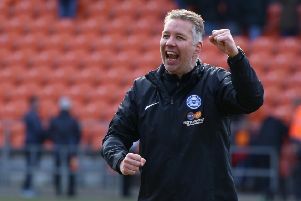 Posh host Championship side Preston, manager Graham Westley’s old club, at the ABAX Stadium in the third round on Saturday, January 9 (3pm kick off). Season ticket holders seats will be held until 12pm on Thursday 31st December 2015. The Motorpoint Stand will be available to home fans. Caroline Hand Executive Suite prices are £25 for adults and £15 for concessions until December 31 and £30 for adults, £20 for concessions from January 1. Tea, coffee, cakes and match day programme included with Executive Suite tickets. Tickets can be purchased at www.theposhtickets.com, via the Ticketmaster hotline 0844 847 1934 or in person at the ABAX Stadium Box Office.